Was looking for a middle eastern feel for a den/guest room. Colors, pattern, weight of rug perfect for the room. Easy to order and delivered promptly. A transitional design and dense, thick pile highlight this handmade rug inspired by Ikat patterns with today's updated colors. This floor rug has a blue background and displays stunning panel colors of green, yellow, red, and brown. Beautiful, colorful rug, thick and soft. The colors are very bold, which I like, we plan to use it in a nursery, knowing its a "grown up" rug... This way we don't have to buy another in 5 years! Very good value and esthetique and originality! This carpet is thick and with beautiful colors and design. These carpets go for a lot more expensive at other stores. I wish the color was brighter. I should have gotten a hand tied rug. "Is this rug blue or green? It's hard to tell and I noticed on the website you sell a green version and a blue version. Thanks!" 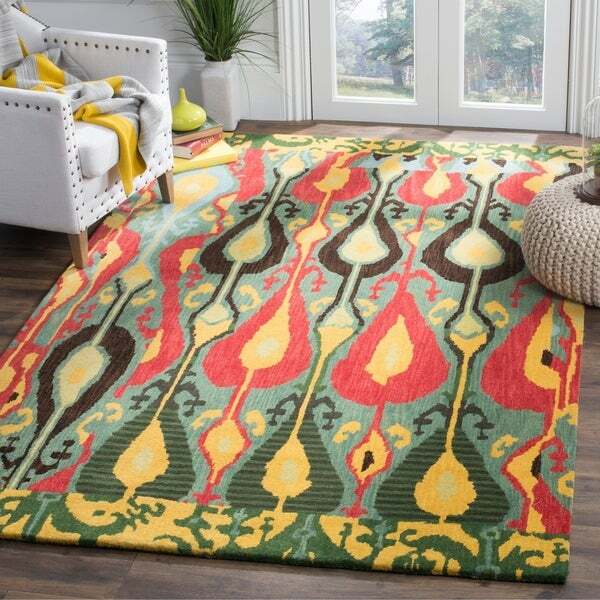 This rug has both blue and green tones, as well as red and gold. Due to differences in displays and the subjective nature of colors, shades may vary slightly. "Is the cotton canvas backing glued or sewn on? Thanks." Hello jrnyc09! This rug is beautiful! The cotton canvas is glued on using natural latex. I hope this helps. Thanks for shopping with us. "Is the red in this rug more pink or more red? It looks pinish online." This is more orangesh red. I would call it a true, primary, red. Colors are a little more vibrate in person.